Place chicken in the Instant Pot, and sprinkle with salt and pepper. Add all remaining ingredients except zucchini. Press Keep Warm/Cancel. Caution: During the next step, keep hands and face away from opening; the fast-escaping steam will be hot! Remove and discard bay leaves. Transfer chicken to a large bowl. Shred with two forks. 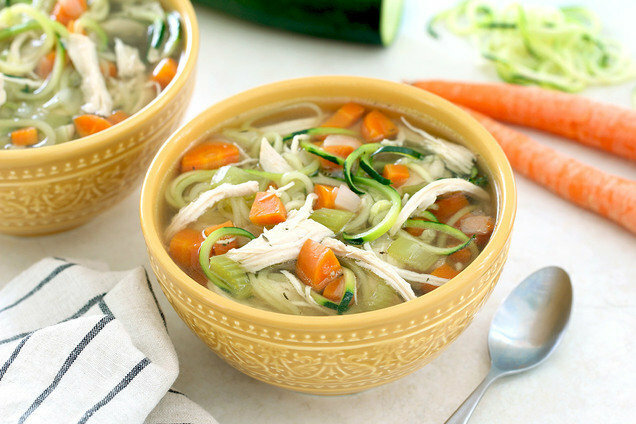 Add zucchini noodles and shredded chicken to the Instant Pot. Re-cover and let sit for 8 minutes, or until noodles have slightly softened.